When the University of Maryland, Baltimore (UMB) sought a manufacturer to create prototypes for new spine surgery instruments that could improve patient outcomes, the University didn’t have to look far. It found its partner in Danko Arlington, Inc., a precision metal engineering and manufacturing firm in Northwest Baltimore. Danko, which was established in Baltimore’s Inner Harbor in 1920, showed that it could enable UM neurosurgery researcher Charles Sansur, MD, to create two implantable devices that could potentially reduce serious complications from common spinal surgical procedures. 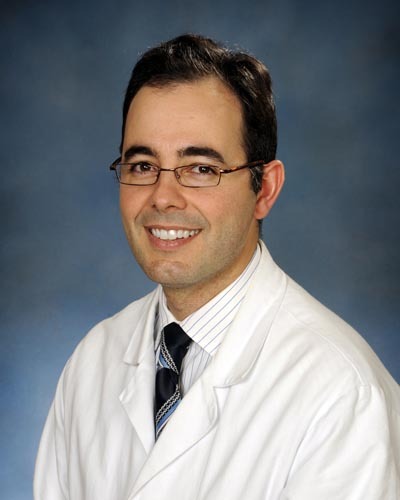 Dr. Sansur, Associate Professor of Neurosurgery at the University of Maryland School of Medicine and Director of Spine Surgery at the University of Maryland Medical Center, is a recognized expert in spine surgery. He specializes in revision spine surgery and in the correction of spinal deformities such as scoliosis. Because of his work, Dr. Sansur has conceived of numerous devices that could lead to improved outcome for his patients. His most recent invention disclosures describe new implantable spinal devices to be used to in spinal disc removal and fusion, and encourage regrowth of bone tissue, without the adverse events that can result from current surgeries. He needed a company that could convert his drawings and ideas into workable prototypes. A new cervical cage device intended for anterior cervical discectomy and fusion (ACDF), which is the standard treatment for degenerative disc disease and cervical stenosis. The device that Dr. Sansur developed may reduce the need for subsequent ACDF revision surgery, and may optimize the opportunity for successful spinal cord decompression. A lumbar interbody cage with new features that will potentially improve spinal fusion and alignment when compared to current techniques used today. Interbody cages fill the gap between the two vertebral segments during spinal fusion procedure. The interbody cage developed by Dr. Sansur allows a surgeon to easily insert bone graft material into the gap, and has properties that may help maintain spinal alignment more successfully than current designs. Danko Arlington converted verbal descriptions and hand drawings from Dr. Sansur into sophisticated 3-D computer-aided design (CAD) models that could be manipulated by Dr. Sansur. The 3-D drawings allowed Dr. Sansur to work with the CAD designer to refine his invention until it matched his vision. Danko then used 3-D printing to produce the devices in plastic. Dr. Sansur was able to use the device in saw bone and cadaver models to determine that the devices performed as desired. Since this partnership began, a leading commercial supplier of spinal devices reviewed the designs and 3-D-printed parts developed at Danko. Based on this review, UMB’s Office of Technology Transfer began negotiating with the company for a commercial license that will allow them to test and evaluate the device. Successful testing of the device is expected to result in the commercial development of the product. More importantly, these devices could be improving the outcome of spinal patients in the near future. Danko Arlington, Inc. was established in Baltimore as an industrial pattern shop in 1920. It is currently run by John Danko, the grandson of the founder, Joseph Danko, Sr. The company was founded as Danko Pattern and Manufacturing Company and was first located on Light and Lee Streets on the Inner Harbor, Baltimore Maryland, and created metal patterns for the US Navy and the then-Baltimore and Ohio Railroad. Danko Arlington was recently recognized for its unique manufacturing and employment practices by the American Foundry Society’s (AFS) as 2017 Metalcaster of the Year. The company is a second-chance employer and works with Baltimore Mayor Catherine Pugh’s Office of Employment Development (MOED), Catholic Charities, Jewish Community Services, Center for Urban Families, Gaudenzia, and a variety of other local employment agencies to hire and train Baltimore residents.